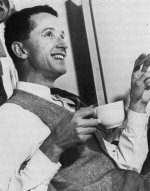 Pauling had a strong interest in quantum physics, which he had studied in depth while on a fellowship in Europe during the late 1920s. Quantum mechanical concepts framed his important work on the chemical bond. Now, in 1940, quantum physics would affect his ideas about protein structure. It started with the work of Pascual Jordan, one of the important early quantum physicists. He had recently turned his mind toward complex molecular structures, writing papers promoting the idea that identical molecules might tend to stick together because of quantum-mechanical resonance. Pauling learned of Jordan's ideas from a physicist at Caltech who was working (oddly enough) on genetics: Max Delbrück, a brilliant German émigré who had arrived in California on a fellowship and never went home. Delbrück told Pauling about the Jordan papers one day when they ran into each other on campus. This was during the period when Pauling was finishing his antibody paper, and had been thinking hard about how proteins could bind to one another. Jordan's idea of identical molecules sticking together was, of course, much different from Pauling's antibody-based idea of complementary structures. He and Delbrück strolled to the Caltech library where Pauling found Jordan's papers and started reading. Within a few minutes, Pauling decided that the ideas presented were, as he put it later, "baloney." He thought it worth writing a brief paper to let the world know why Jordan was wrong, and after he did so, asked Delbrück to sign on as a coauthor. Delbrück, not wanting to appear impolite to the great American chemist, made a few minor changes and signed his name. Their paper, "The Nature of the Intermolecular Forces Operative in Biological Processes," published in Science in the summer of 1940, effectively demolished Jordan's ideas about identical molecules, clearly stated Pauling's views on the importance of complementary, die-and-coin relationships between biological molecules (the same sort he had seen sticking together antibodies) – and went almost unnoticed. "The case might occur in which the two complementary structures happened to be identical; however, in this case also the stability of the complex of two molecules would be due to their complementariness rather than their identity. When speculating about possible mechanisms of autocatalysis it would therefore seem to be most rational from the point of view of the structural chemist to analyze the conditions under which complementariness and identity might coincide." A molecule making copies of itself - autocatalysis – is what happens when genes replicate. Pauling was thinking about proteins when he wrote the paper. But his brief aside is now seen as a remarkably prescient statement about the nature of the DNA double helix. See Also: "The Nature of the Intermolecular Forces Operative in Biological Processes." 1940. See Also: Letter from Max Delbrück to Linus Pauling. January 7, 1941. 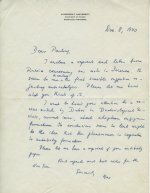 Letter from Max Delbrück to Linus Pauling. December 8, 1940.